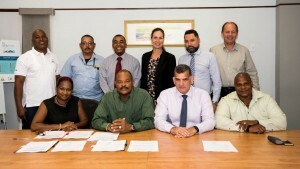 WILLEMSTAD - Last week, Curaçao Ports Authority (CPA) and the union Petroleum Workers Federation of Curacao (P.W.F.C.) signed a final agreement on a new collective agreement (CAO) for the CPA staff that operates on the bridges, ferries, and Technical Services at Parera. CPA develops and is responsible for the operation in the ports of Curaçao. In an environmentally responsible manner, nautical services are offered, where the safety and security of the port are priority. Both parties are satisfied with the results achieved. The signing of the new CAO on took place on Thursday, December 22, 2016, at the CPA office building. Here Mr. August Winter, company lawyer, Karin Jongen, Manager Human Resources and Arlette Goeloe, HR Advisor, as well as representatives of the trade union P.W.F.C. were present. The signing took place by the CPA Director Mr. Humberto de Castro and on behalf of the P.W.F.C., chairman of the union, Mr. Angelo Meijer, Mr Chellon Rumai, Secretary and Mrs. Sharette Janga, treasurer.